Presented by Fremantle BID, Winterworld Fremantle is a wondrous place where families and friends rug up and come together to revel in the magic of our favourite season! Winterworld Fremantle is this July holiday’s most unique experience with its wide range of activities for the young and young at heart. 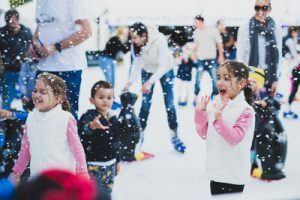 It’s time to put on your winter woollies (yay) and experience the true magic of gliding around Australia’s largest open-air ice skating rink with falling ‘snow’, kids squealing with excitement as they build a snowmanin the real snow pit, fly down the giant inflatable slide and get crafty with arts activities. Relax inside The National Hotel’s warm cosy Cabin Bar sipping on mulled wine and warm winter beverages as you gaze over the rink and through Freo’s famous Norfolk pines. Explore the NEW Market Square with local producers and retailers showcasing their winter wares and food stalls serving heart-warming delicacies from across the globe. Grab a spot and roast marshmallows around the blazing fire pits which are scattered throughout a themed outdoor area covered with soft rugs and inviting tunes. With a few surprises still up our (woolly) sleeves – WATCH THIS SPACE for announcements on some exciting performances and interactive fun that will be sure to amaze the whole family! Winter has never looked so good! Winterworld Fremantle is accessible for all, including wheel chairs and ‘wheely friendly’ ice skating sessions throughout the season. Enjoy exploring the markets and plenty of late night skate sessions for that perfect first date, or a fun night out with your loved ones. For many WA locals, this will be their first experience seeing ice and snow. For others, it’s a chance to re-live some of the magic snow and European winter experiences you’ve had on holidays. 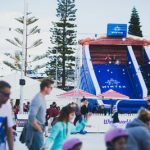 “Fremantle BID are very excited to be welcoming back Winterworld again this year. 2018 will be bigger and better with an emphasis on the Market Square where many local Fremantle food and retail businesses will be sharing their wares set against a magical Winter back drop. We are proud to bring in an event that supports local businesses and gives people a great reason to visit our wonderful port city in the winter months”, said Fremantle BID Chairperson Karl Bullers. Secure your early bird tickets and save $$$, including UNDER 5 FREE! Winterworld is open from 8:30am– till late each day.